Sapping Attention: Crisis in the humanities, or just women in the workplace? Crisis in the humanities, or just women in the workplace? OK: one last post about enrollments, since the statistic that humanities degrees have dropped in half since 1970 is all over the news the last two weeks. This is going to be a bit of a data dump: but there's a shortage of data on the topic out there, so forgive me. In my last two posts, I made two claims about that aspect of the humanities "crisis:"
1) The biggest drop in humanities degrees relative to other degrees in the last 50 years happened between 1970 and 1985; the lower level over the last 25 years is not far out of line with pre-1960 levels of humanities majors (and far exceeds it if you account for population). 2) The entirety of the long term decline from 1950 to the present has to do with the changing majors of women, not of men. To understand where the long-term parts of the crisis come from, that implies, you have to look at what women used to major in, and how those majors have changed. That's what this post is about. 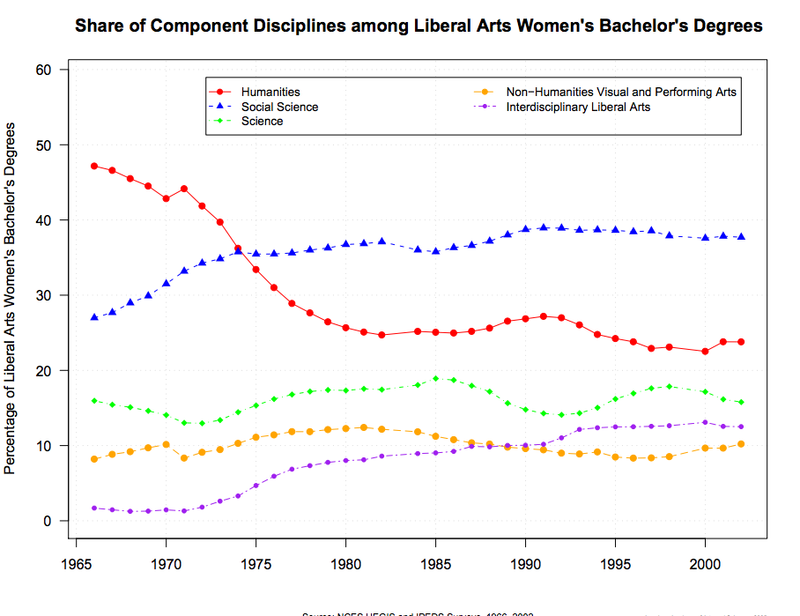 Digging back into some files I made working at the American Academy's Humanities Indicators project for Malcolm Richardson and Leslie Berlowitz years ago, I found some poor but suggestive data about what women were majoring before the big humanities boom of the 60s. The exact accounting is a bit opaque to me now (some of the categories occur twice, such as education and various subfields of it, and I think MBAs may be included among the bachelor's degrees). But it gives a sense of the gender ratios and relative sizes of a number of fields before the boom. 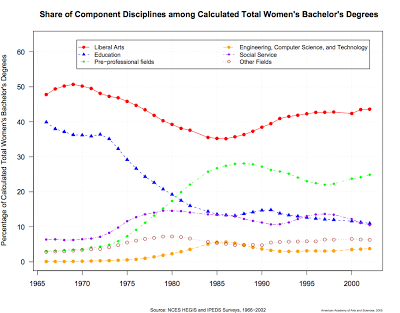 The most interesting parts of this chart--expand to see it larger--is that in 1957, the social sciences were more than 2 to 1 male, while teaching fields were 2 to 1 female: and a number of fields were completely dominated by men, including economics, chemistry, accounting, and business—a very large field on its own, even back then—was 92% male. In the humanities, history is predominantly male, but English and foreign languages are predominantly female. "Religion" is predominantly denominational, I believe. Click to view in a readable size. OK. Fast-forward to 1966, when the computerized databases start. Here's the big-picture scheme of women's college majors from then to 2002, from an early draft of the Humanities Indicators. By "Liberal Arts," I mean basically the sciences, social sciences, and humanities. 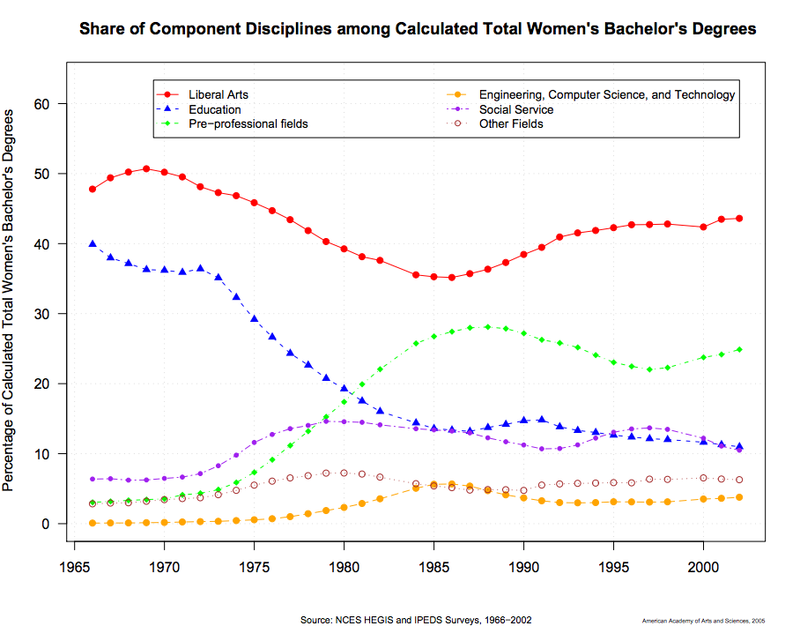 Education degrees were already falling by 1965; based on the 1957 numbers, I'd guess more women were education than liberal arts majors a decade before this chart starts. Note here the steep decline in both education degrees and liberal arts degrees: those were female-friendly fields in the 1950s, but women abandoned them in droves after 1966 for the pre-professional fields, which had almost no women in the 1950s. So the big story has to do with pre-professional degrees: in particular business (more than 75% of all pre-professional degrees for women), but also journalism and communications (about 20%). 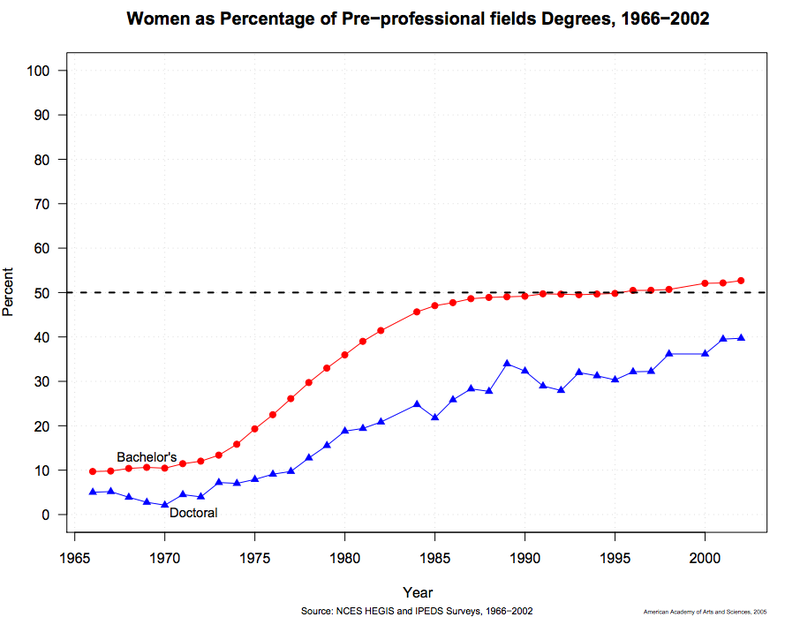 Before co-education, only about a tenth of pre-professional degrees went to women: after 1985, they were half. And since the whole puzzle is how women's behavior changed, not how men's majors changed, this tells you most of what you need to know. What about within the liberal arts? I would have thought that women left the humanities as the sciences opened up to them in the 1970s. But that's not the case: as a percentage of all liberal arts degrees, there was no relative reapportionment into the sciences. Instead, there was a drift into the social sciences, and into the nebulous category of "Interdisciplinary liberal arts" and "general liberal arts." (I have no idea what that means, but it's probably not a bad major, all told.) The sciences largely missed out on their chance to dramatically increase their percentage of women during the era of co-education, although they did get more female. 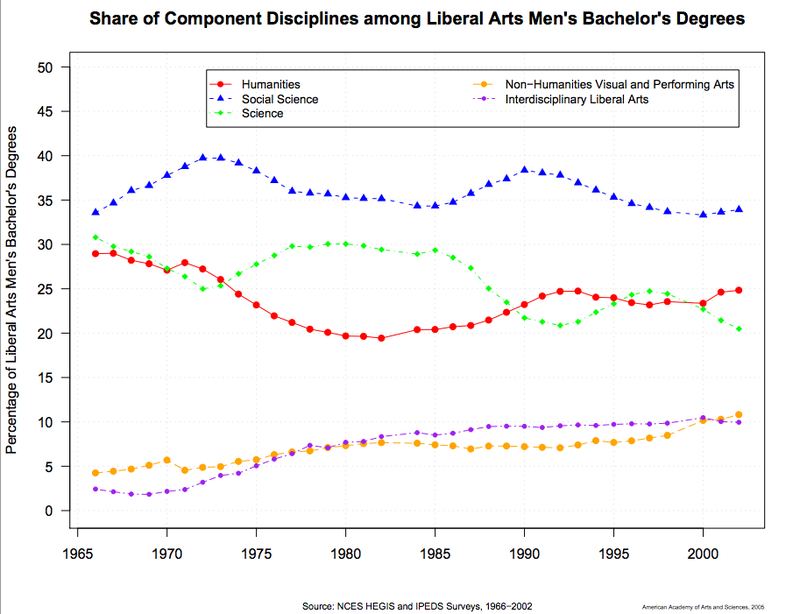 For men, the dropoff for the humanities inside the liberal arts is not nearly so steep: the rebound doesn't capture all the reapportionment, but it does get a lot of them. The humanities actually do better than the sciences among the liberal arts; count those interdisciplinary majors as humanities, and there is no problem at all. 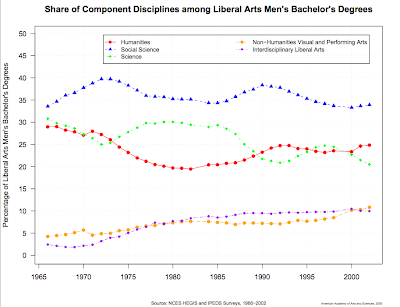 Or remember that history only became widely identified as a social science humanities field in this period (ed.--which is where it's charted here), and that area studies programs also drifted more and more humanistic (most are included as social sciences in this chart). These graphs do begin in the anomalous period of high enrollment: it's too bad I don't have them back to 1957. But given what we know from the big picture, I think it's safe to say that ostensible reason for the long-term collapse in humanities enrollment has to do with the increasing choice of women to enter more pre-professional majors like business, communications, and social work in the aftermath of a) the opening of the workplace and b) universal coeducation suddenly making those degrees relevant. You'd have to be pretty tone-deaf to point to their ability to make that choice as a sign of cultural malaise. So what? This is all ancient history. Coeducation is no longer driving humanities enrollment trends. I keep harping on it because telling the story of a humanities "crisis" that stretches back to 1967 severely confuses things, because it tries to blame the 70s collapse on forces that are still relevant today. These are two completely different stories. And even if the sky is falling right now, it's pretty important to remember that everything appeared completely normal for the humanities at the undergraduate level as recently as 2008 or 2009. The personal recollections of college of anyone over about 25 years old aren't particularly relevant for understanding what's going on in the humanities right now. The solution isn't trying to return the humanities to the 1950s; it's lessening the anxiety that makes students feel they can't afford to major in the humanities, right now. Luckily, there's some reason to believe that should be easy to do: Jordan Weissman gives some much-needed publicity to the fact that the employment numbers for humanists are in line with supposedly "practical" majors like economics or computer science. (Why is it that claims for the obsolesence of the humanities always talk about those fields, rather than the real employment utopias of nursing or education?) But there's something about the "humanities" that makes it hard for us to talk about them in anything but the most portentous ways. I'm still trying desperately to wrap my mind around what happened in the 1960s - which, in some sense, is the real anomaly, with the collapse of the 1970s being something more like a reversion to the mean. I can think of any number of factors. It was a golden decade, with persistently low unemployment. At the same time, the long-shrinking college wage premium began a precipitous rise midway through the 1950s. Both of those trends reversed in the 1970s - jobs were harder to find for everyone, and the wage premium sank again. So perhaps this allowed students to pursue their interests in the 1960s, relatively insulated from concern over their careers. Or maybe it was the concurrent rise of the oft-maligned middlebrow, which meant that students grew up in homes with Books-of-the-Month and Reader's Digest, and so even first-generation college students felt that the humanities were attainably within reach and not the exclusive property of cultural elites. Or it could be precisely the crumbling of the pre-war elite and the rise of the putative meritocracy, creating a decade-long transitional window during which the acquisition of the cultural status conferred by humanistic pursuits still seemed like a passport to a better, or at least a more respectable, life. But I can't quite square that with the gendered narrative you present here. 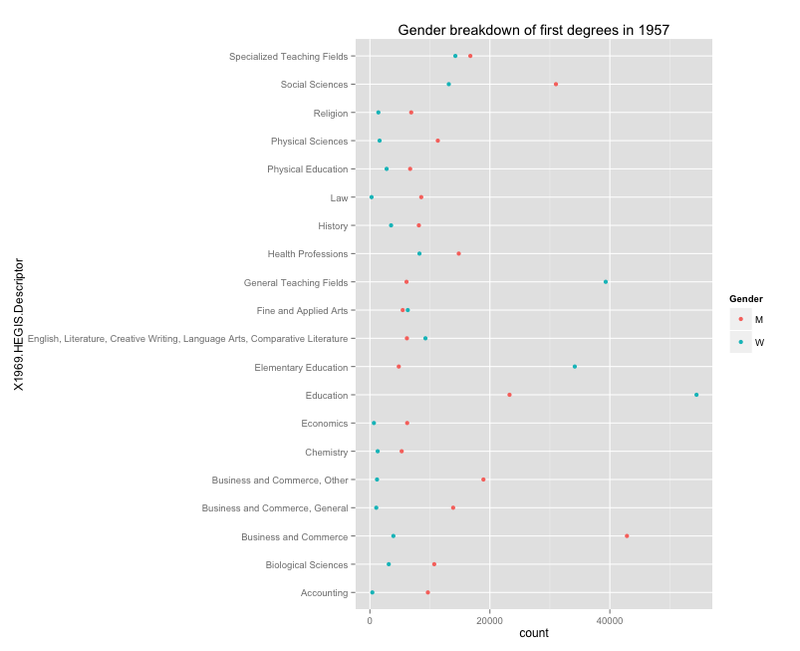 If entry into a broadening array of career fields, and sudden concern over employability, led to the decline of the 1970s, then what accounts for women's sudden embrace of the humanities in the 1960s, at both a relative rate and an absolute percentage higher than men of the era? If the 1970s decline looks something like a reversion to the historic mean, then shouldn't it be at least partially attributable to a reversal of whatever factor had driven the equally precipitous rise a decade earlier? There's certainly room enough for multiple explanations. 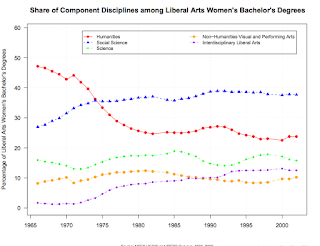 From your graph, it looks as if women majored in the humanities at rates ~14% in the 1950s, surging to a peak of around 23% around 1967, before falling to a contemporary band of 7.5-9%. (Do I have that right?) So I'm perfectly willing to be convinced that the sharp fall from ~14% to ~8% is a consequence of broader career opportunities and the increasing availability of pre-professional majors. But I still don't understand the surge up to 23% - and so I'm not quite persuaded that I understand the entirety of the drop that followed. Thoughts? Really good questions, and I don't really feel confident I can answer them: in places where I've had a gut feel about changes in majors (the one I say here, that more women majored in the sciences over the 70s and 80s; I also had, for a time, a theory that changes in the Vietnam-era draft were helping artificially inflate the number of men at universities) I'm very frequently wrong. (Although the GI bill is an important missing factor in the whole equation). I have most of the big drop from 1970 to 1985 still unexplained. All I explain in this post, I think, is the drop in women excessive to the drop in men--which is all that's needed to explain the difference between 1950s universities and modern universities. If you look at Ph.D.s, the situtation is quite different. The humanities are about 23% of all PhDs from 1920-1940, followed by a sharp drop to be stable at 14% 1945-1968, followed by a slower drop down to 8% in the last thirty years. So there's some truth, I think, to the idea that the humanities are a smaller part of the R1 universities now than they were in the postwar era. But higher education has become much more R1 centered in the last 50 years; back then, normal schools, seminaries, and conservatories were a higher percentage of degrees. (I'm guessing without data, here). And then in the early 70s, after tearing themselves apart for 5 years all the research universities started to drift into offering more business/applied majors, whether they started the period as an Ivy/Flagship or as a normal school (Say, a place like Ball State University (Ball State Teachers College until 1965--not an atypical timeframe, I don't think). 1) the drop just happened because of inertia: the rise to 1970 was unsustainable. (This is unsatisfying). 2) The rise happened to 1970 because the baby boom put an enormous strain on the nation's higher education system, and the uniform response was to try to turn every college in the United States into Berkeley. One way to test that theory would be to check if humanities degrees at the Berkeley/Harvards of the world rose from 1955 to 1970. The more they did, the less this theory is useful. Great post, which raises great questions. The middlebrow hypothesis seems very interesting. On similar lines: I wonder if schooling for middle class people may have pushed high school grads into humanities more than in more recent years, especially if they were in what I remember friends' parents calling the college track. Students in our town in Connecticut (OK, a tiny data point, but what do I know?) who were in the top track in the public schools did Latin (and, in some cases, French), plus a rigorous English program headed by a charismatic teacher with a doctorate, who later moved to a college, and AP US history (though that looked more like a social science in the 60s). All this before double sessions, of course, as the python bulge of the baby boom changed conditions for students and teachers. I really like your point number 2): everyone was trying to build Berkeley, you can still see this, like tree rings, in the great library collections created or enlarged around the country in those years, to support the advanced teaching and research that were going to take place everywhere. 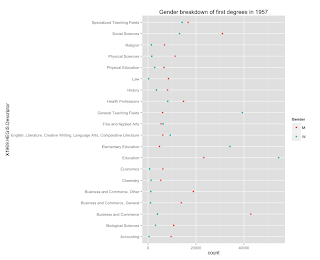 So the bubble in humanities degrees may at least partly reflect a dramatic increase in the proportion of female college students in the mid- to late-1960s, at a time when career options for women remained quite limited. As career options opened up in the 1970s and 80s (as you describe) the bubble disappeared. Vanitto style variety of the foremost beautiful gemstones jewellery london on the planet so as that you will look swish, elegant and delightful.